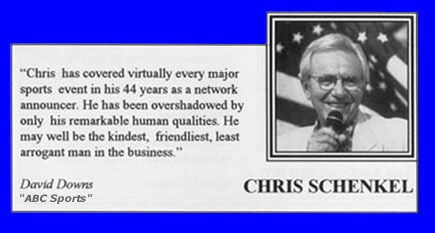 For 46 years, Chris Schenkel has been informing and entertaining sports fans from coast to coast. His smooth, mellifluous delivery is part of the mystique that has made Chris one of the most easily listened to broadcasters ever. That, and the competence he brings to the coverage of such a wide range of sports, has provided him unparalleled durability and prominence on the national stage. Whether it was bowling, the Olympics, NFL or NCAA football, the NBA or boxing, Chris has been there...done that. He was among the first to report football on television starting with the Harvard games in 1947. His statistics are of record book proportions...voice of the New York Football Giants for 13 years, Voice of ABC's NCAA College Football for 12 years and NBA Basketball for several seasons, voice of the Monday Night Fights for 6 years, 9 Summer and Winter Olympic Games, 100's of thoroughbred horse races and all the major Triple Crown events. He has also covered almost every major golf and tennis championship since 1953. Saturday afternoons on ABC meant Chris Schenkel at the Pro Bowlers Tour since 1962. It is no wonder that Chris is already one of the most honored sportscasters in the nation. His induction into the American Sportscasters Hall of Fame follows such accolades as National Sportscaster of the Year four times, recipient of the Pete Rozelle/Pro Football Hall of Fame Radio-Television award and the Golden Plate Award, presented by the American Academy of Achievement. He was also granted an Honorary Doctorate from his alma mater, Purdue University and from Ball State University. As a result of his enduring involvement with American Indian affairs, Chris was named an honorary Chieftain in the Miami Indian Council of Indiana.